(Just purchase the English graphics here. After your order is placed the Graphic Packs Dazzle will email you within 24-48 hours to request information to customize your graphics, including your preferred language. 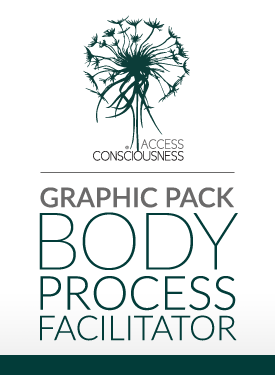 Are you ready for your Access Body Process Facilitator's business to expand with total ease? Are you looking for professional material to have available when people ask "What do you do?" or "What is Access Consciousness?" We're so excited to announce that the new brochures, business cards, email signatures, expo banners and more are ready for YOU! Totally refreshed and ready get to work! Have a look! Includes personalized: Logo; Postcard flyer; Email signature strip; Trifold brochure; Business card · Expo Banners. Note: this is not an instant download. Please allow 24-48 hours for a Graphic Pack Dazzle to contact you for additional information to customize the pack for you.